Was It Haunted or Just Creepy? Was It Haunted or Just Creepy? You are here: Home / Paranormal Experiences / Was It Haunted or Just Creepy? Once upon a time, I used to travel a lot for work. I would stay in all sorts of hotels due to their proximity to the conference or event I was attending. A short time ago, I took a business trip out to LA and had the opportunity to stay at the Millennium Biltmore Hotel. This hotel’s haunted history, as legend has it, is the last place the Black Dahlia (aka Elizabeth Short) was seen in 1947 before her dismembered body was discovered in a weedy patch south of town. I completely blanked on this fact until I was mentioning to my fiance that I hated passing one of the staircases near my room. I always felt like there was someone standing on the floor above watching me as I walked past it. He reminded me of where I was and that it had a long history. It was at that point that I started to think about other locations that I stayed in that were creepy and wondered if they too had shady pasts that could have left either residual energies behind. There was one location in NYC that I stayed in. It was a small boutique hotel not to far from where my conference was being held. From the moment I saw it I had an uneasy feeling about it, but I attributed it to the fact that it was under construction and in an unfamiliar part of the city and it was getting dark. I checked in and went up to my room on the third floor. The elevator was small and smelled a little funny. The worst was when I stepped off of the elevator onto my floor. I was met with something that made me feel so uncomfortable, I ran to my room. Mind you this, was years before I learned how to set boundaries with entities and how to protect myself and my space. I went to the evening conference event and returned around 11:00 because I had an early start the next day. Again, I reached my floor and was met with the uneasy feeling I had as I got off of the elevator. As a light sleeper, I could hear footsteps pacing up and down the hall. However, I never found anyone in the halls when I would look out my door. The next two nights, I had similar experiences. 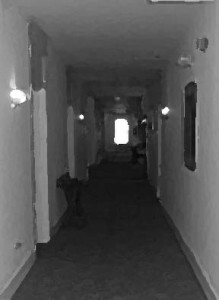 Back then, I didn’t have the nerve to ask the hotel staff what it may have been for fear of being ridiculed so to this day, I still don’t know if the hotel was haunted or just creepy.